Making the decision to take up running can lead to immeasurable benefits in your life, including helping you build a physically healthy body, decreasing your risk of illness and improving your emotional well-being. Once you change into your running gear and lace up your shoes, your next priority is to find a route for running. The impact to your body's joints as you run is an important factor to consider. 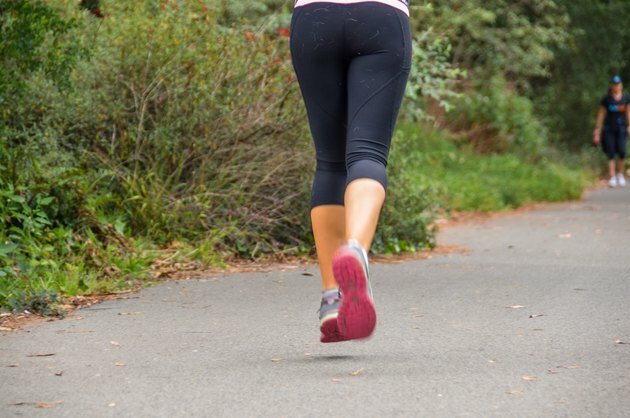 Although concrete and asphalt are each hard surfaces, concrete is harder and might result in more joint pain, especially if you overtrain or don't run with the proper form. According to a 2006 article in the "San Diego Union-Tribune," however, the surface on which you run doesn't play a significant role in most running injuries. When running on either surface, ensure your shoes fit comfortably and provide the necessary cushioning. If you experience joint pain, shorten the length of your runs or allow more recovery time. Running on the sidewalk might generate more impact to your joints, but this surface is a smart choice if you're concerned about safety. On the sidewalk, you don't have to deal with the risk of traffic, which is a legitimate concern for those who run on the street. Because many cities encourage cyclists to use the street, the sidewalk is often reserved for those who walk and run. Running on the sidewalk also often puts you in close proximity to grass, which is an ideal surface on which to run for your joints. Consider varying your workout by running on the grass at the edge of the sidewalk to note if your body feels better. If you've taken part in marathons or other running events, the street is safe because it's often closed to vehicles. During everyday runs on the street, however, you're often surrounded by vehicular traffic and must be vigilant to stay safe. Wear brightly colored clothing and always run facing traffic. Keep to the edge of the street or the shoulder as much as possible. If you run at night, wear reflective apparel and carry a light with you. Remember that you're sharing the street and don't assume motorists will provide you with the right of way. Regardless of where you choose to run, being mindful of your environment helps keep you safe. Try to run as a member of a group and avoid listening to loud music that might make you unaware of your surroundings. If you run alone, carry a cellphone with you and share your route and the estimated length of your run with a friend or loved one. Avoid running in dangerous neighborhoods or taking shortcuts through dimly lit area.